In late winter of each year, we offer a Fiberglass Boat Repair Workshop (nicknamed Glue U) where we teach the best practices for boat repair with epoxy. This session is geared for marine professionals—yard pros, composite repair specialists, managers, surveyors, insurance inspectors, and dealers—anyone who works building and repairing composite hulls and parts. The 2-day Boat Repair Workshop includes classroom-style instruction and plenty of hands-on epoxy projects. Attendees learn the best approaches to make long-lasting, cost effective boat repairs with epoxy and will come away with a deeper understanding of modern composite technology. Day One topics include Safety, Basic Techniques, Fastener Bonding, Composite Technology, Composite Repair, Fairing Application and Techniques, and Gelcoat Repairs Over Epoxy. 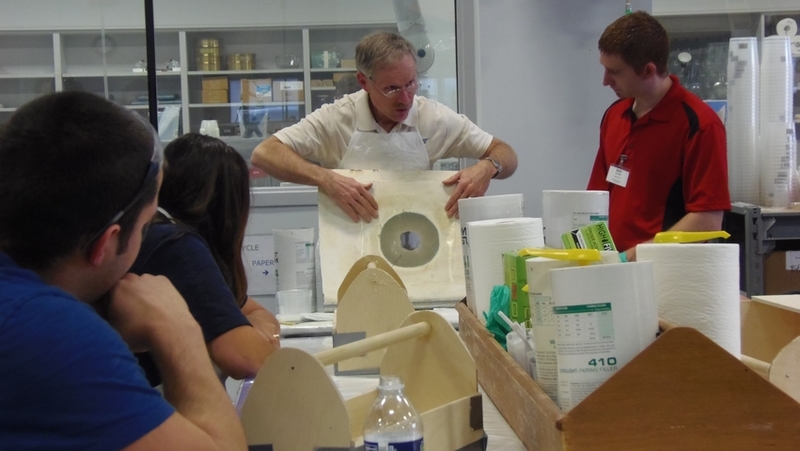 Day Two delves into Gelcoat Blister Repairs, a tour of our testing and product development labs, Specialty Epoxies, Repairing Wood in Fiberglass Boats, and Methods for Removing Epoxy Bonded Fasteners. The Gougeon Brothers Technical Staff has been teaching a seminar on fiberglass boat repair techniques during the winter off season since 1987. Technical Advisors Tom Pawlak and Don Gutzmer teaching at our Fiberglasss Boat Repair Workshop. The cost of the workshop is under $500 and covers two days (4 hours) of instruction, all materials, hotel accommodations for both nights, continental breakfasts, lunches each day and dinner the first night. For complete details, download a pdf of the course brochure. How you get here is up to you. It will be February in Michigan, so expect plenty of snow. Skis, snowshoes or even iceboats are travel options. Our advice: pack winter boots and warm clothes. The classes are held in our new Technical Building here at the World Headquarters of Gougeon Brothers, Inc. where WEST SYSTEM epoxy is manufactured in Bay City, Michigan. Note: The Fiberglass Boat Repair Workshop is not designed for the customer building one-off wooden boats. However, wood in composite structures and wood as a structural fiber are addressed.